Overview: Participants in this Creo week-long class will create detail drawings with modern drawing standards. Participants have the option to customize this course to fit their specific job requirements so they are able to learn exactly what they need. For example, in our effort to cover advanced assemblies we may do a serious introduction to Mechanism. Call today and ask us how this and other classes can be administered on weekends for more than two students. This course can also be administered as a week long Advanced Assemblies class omitting Detail drawings. Speak with your instructor before hand to customize this training. Onsite Training: This and all Design-Engine courses are offered onsite at your facility also. Call to speak to an account manager to arrange a class 312.226.8339 today. Projects: The instructor has a multitude of parts and drawings to be used. Next Class: Learning Creo Surfacing WEEK long or Creo Top Down Design Training or Advanced Assembly week long intensive is recommended as a next class. Prerequisite: Creo Training Level 1 is recommended but not necessary. Annotations, Dimensioning, Ordinate ANSI standards. Managing drawings that contain family tables. Manage ANSI standards in Creo drawing mode. Instead of hiding parts learn to use simplified reps. Manage exploded views in Creo drawing modes. Print, Import and Export PDF, IGES, STEP. 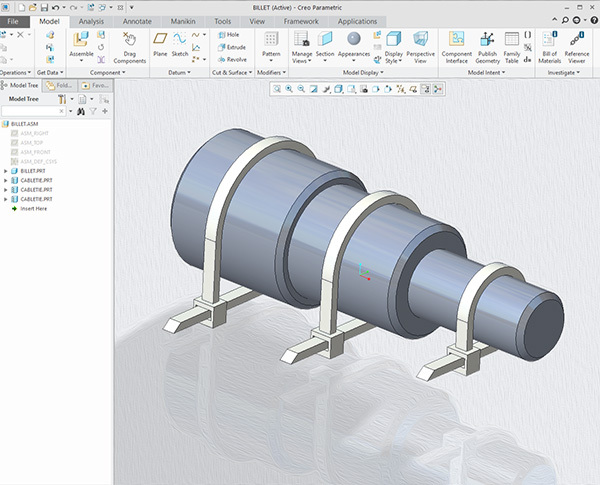 Utilize advanced assembly functions such as skeleton parts & top down design. Learn to create title blocks and use parameters to automatically populate drawings. Depending upon the instructor or class interests we can administer a serious introduction to Creo Sheet metal. Discuss the use of geometric tolerance in Creo drawing mode. Discuss adding and modifying Creo detail notes and related workflow issues related to standard and custom notes on drawings. 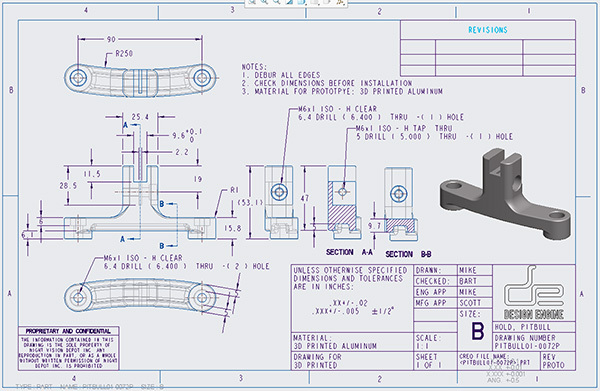 Discuss standard drafting principals and relate those to Creo Drawing Mode. Discuss how administrators set up Creo drawing formats for the automatically populating data on company standard. Discuss output and strengths and weakness of exporting to PDF, DXF, or postscript for printing. Also discuss in detail printing to PDF with shaded view ports. 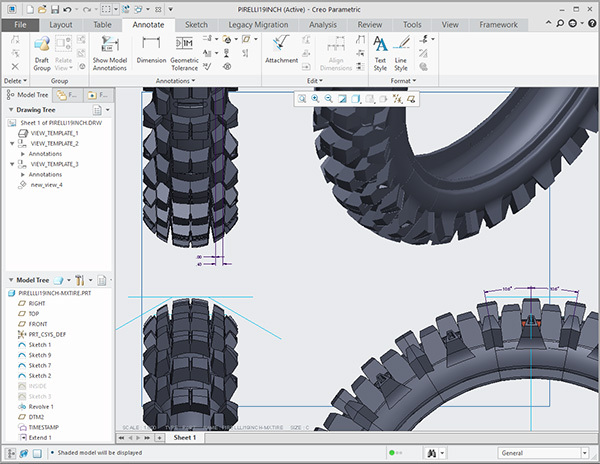 Discuss symbols in Creo and their use with respect to workflow. Create various skeleton parts, publish geometry for various team members. Set up constraints using Mechanism Design Extension and learn to export video. Learn to use servos within Mechanism. Top-down Design in seven flavors. Create one-way associative models, which allows participants to inherit the changes from the parent model, and then make changes to the new model. Flexible Components ie. springs and cotter pins move as components exercise through their motion. Replace components in Creo Assemblies or Sub assemblies. Improve performance by simplifying large assemblies. Using a wide variety of top-down design tools to build the skeleton model. Use top down design to communicate among team members more effectively. Learn to auto generate Bill of Materials. Learn to pattern more effectuate with assemblies. This Creo course is a comprehensive detailing and managing engineering changes utilizing the latest release of Creo. This Creo training course is developed for newer and seasoned users alike who want to become proficient at creating documenting and managing drawings and assemblies in just one week. We help you learn Creo detailing and assemblies not by reading to participants from an exercise but by solving problems with this powerful tool set. We often depending upon participation cover 6 hours sheet metal or 6 hours mechanism within this class. In this course we help design engineers learn how to make changes quickly to set them up for becoming experts faster. As with all Design-Engine classes, participants keep the training material login and password for life.